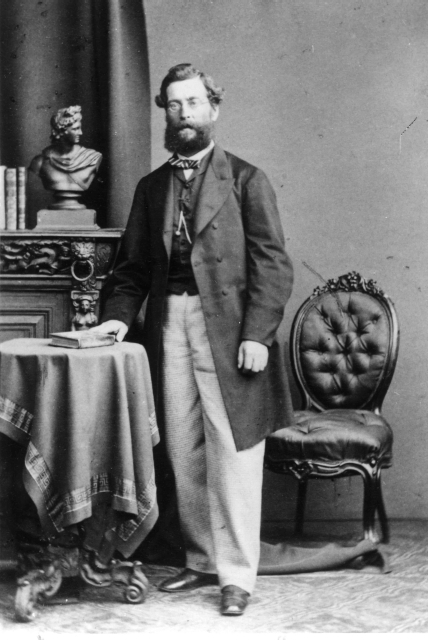 Lewis Franklin was born in 1820 in Liverpool, England. His family roots were in Silesia, a part of Posen in Poland, recently incorporated into Prussia. As a young man, Franklin sailed to Jamaica to help a brother’s mercantile business, but soon sailed again to Baltimore, Maryland, where he heard of the discovery of gold in California. 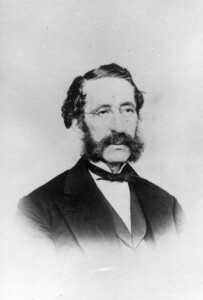 Lewis Franklin then sailed to San Francisco, where he opened a store and invited Jews of the area to join him at High Holy Day services – the first conducted in California – in 1849. Impressed by Franklin’s leadership, the Jewish community of San Francisco invited him to deliver a High Holy Day sermon the following year, in which he beseeched his co-religionists to be faithful to the Torah and to help Judaism in California. In 1851, Lewis Franklin moved to San Diego, where he opened a general store. He again hosted High Holy Day services, although only two fellow Jews – Mark Jacobs and Charles Fletcher – attended. Franklin eventually acquired the Exchange Hotel alongside San Diego’s plaza, and changed its name to the Franklin House. At three stories, it was the “skyscraper” of San Diego in the late 1850’s. There, Franklin’s older brother, Maurice Franklin, established a pharmaceutical business, and eventually became a partner with Lewis in the hotel. After Maurice brought his bride, Victoria Jacobs (daughter of Mark Jacobs), to live with him at the hotel, the two brothers began to quarrel, eventually becoming so embittered with each other that a court had to decide how to divide the assets – much to the enjoyment of the townspeople for whom courtroom dramas were a major entertainment. Lewis Franklin kept the hotel. Maurice Franklin got his pharmaceuticals. Along with Victoria and a son, Abraham, Maurice to relocated to San Bernardino. Lewis Franklin served as foreman of San Diego’s first County Grand Jury. He soon won election as a County Judge. Among miscreants indicted by Franklin’s grand jury for dueling, which was illegal in California, was Mayor Bean’s younger brother, P. Roy Bean, who dug his way out of jail with either a spoon or a pocket knife. In 1859, the Franklin Hotel was the venue for High Holy Day services conducted for San Diego’s small Jewish community. As there were only ten men present during the service, Lewis Franklin and others raised objection when the Grand Jury sought to compel one of the worshipers – Moses Mannasse – to give evidence about an assault that he had witnessed. A posse was deputized to compel Moses Mannasse to leave the High Holy Day services and walk two buildings away to the courthouse to give testimony. Once at the courthouse, however, Moses Mannasse declined to give testimony until after sundown, when Yom Kippur was over. Lewis Franklin wrote a letter to Jewish newspapers throughout the United States in which he contended that forcing Moses Mannasse to testify on a High Holy Day was a grave insult to the Jewish people. Franklin eventually left San Diego for Baltimore, and later returned to his native England, where he lived out the rest of his days. Lewis Franklin died in 1879, leaving a wife, Emily, and three children. Norton B. Stern, “Lewis A. Franklin,” Western States Jewish History 41/1. Norton B. Stern, “The Franklin Brothers of San Diego,” San Diego Historical Society Quarterly 21/3. Donald H. Harrison is curator of this Lewis Franklin exhibit.